How to repair torque wrench? Best option for you to repair torque wrench. If you are using a torque wrench, then you better be acquainted with how to repair torque wrench. Because without knowing the valuable ways of repairing a nice torque wrench, you won’t be able to work with a single torque wrench for a long long time; rather, you’ll feel buying more and more which is nothing but a load to your pocket. Without loading your pocket heavily, you can easily make up with a single torque wrench just by knowing a few steps to repair or clean a nice torque wrench. But in order to know how to repair torque wrench, you have to know what problems might occur with a torque wrench! What can occur if you’ve promoted problems in a torque wrench? When you are working with a torque wrench for a long time, you’ll see that it isn’t giving the same amount of reading at the same task. You can check a single task with a single torque wrench after a month. > Keeping the torque wrench pressured will cause the meter deflection for a long time. This solely happens in case of a dial torque wrench. When you are keeping the torque wrench at pressurize position, the spring loses its elasticity over a long time and ultimately you need to repair this. > If you immerse the total torque wrench in water thinking for better cleaning, then you have done a great mistake. This causes water spilled into the hinges and if it is done intermittently, the steel body won’t be any more corrosion resistant. As more time will pass by, there will be rust grown very easily. > Lubricating the torque wrench thinking of better service will cause the damaging of the product. Most of the torque wrenches come with permanent lubrication into its hinges and joints. Additional lubrication will certainly cause wrong readings without your knowledge. > The lock knob is situated at the bottom portion of most of the torque wrench. This lock fixes the length displacement tightly. Problems in this knob can cause improper torque measurements without noticing you. > In case of the click type torque wrench, you’ll observe that you are missing clicks. This occurs because of rusting and dirt’s allocation in the ratchet head teethes. 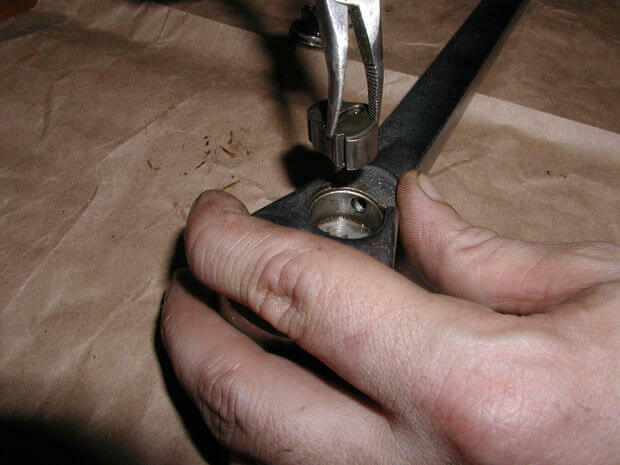 Due to this problem, some fasteners get tightened tightly and others a bit loosely compared to the first one. This can cause you major problems, especially in vehicle tires. > You’ll see that the torque wrench has locked when you force the torque wrench at its first state. When you apply a great amount of force, it starts moving smoothly. The first power force can cause you problems in case of delicate workings. The torque wrench needs to be uniform in all its 360-degree angles unless the torque applied can have transient conditions. Transient conditions are harmful to delicate works. > Problems with the lock button at the bottom neck of a torque wrench give you improper ratings of applied torque. Torque is the amount of force multiplied by the handle length; predominantly where you hold the handle. There is a grip where the user is to grab the wrench. If the lock knob isn’t working properly, then you won’t be able to apply smooth torque on the fastener you are to work on. A torque wrench can go through several problems due to a good time of continuous usage. Like all the other things in this world, torque wrenches also undergoes through depreciation. But the amount of depreciation can certainly be lessened through a few steps. > If you’ve accidentally immersed the torque wrench in a drum filled with water; then you need to follow a few steps instead of panicking. First, take the wrench in the open wind; it’s better if you can place the wrench in exposed sunlight. Addition to that, use a blower to remove all the water particles hidden inside. > Ratchet head is one of the most important parts of a torque wrench. When you’ve started to know how to repair a torque wrench; then ratchet head should come first in your knowledge line. Inside the ratchet head, there are teethes clicking on which, the torque wrench sounds as click while revolving. Make sure that all the dirt and dust particles are cleaned with dry paper or fabric. Remove as much as filth possible with it. Lastly, clean every tooth with a very fine fabric which is lightly drenched with clean water. In most of the torque wrenches, you won’t be able to do it with bare hands. You might need a needled tool to clean everything. > The drive head on the torque wrench lies on its lid. Sometimes, its edges can get tampered. In such cases, you better remove and install another driver. The driver measurement is truly important to drive any fastener perfectly because hinge to hinge settlement is mandatory for perfect tightening. Using a torque wrench is truly convincing; especially when you know all of its features and the techniques of usage. But if your tool is faulty, then you’ll never get the excitement of perfect and precise work. Therefore, it is always recommended that you use the best tool and also know the techniques of fixing your own torque wrench in case of any sort of difficulties. Therefore, it is mandatory to know how to repair torque wrench because, without it, your expenses are gonna go way long that you can never imagine!